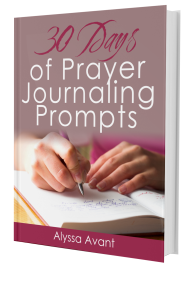 This 30 days of prayer journaling prompts should help give you ideas for journaling for at least 30 days. This will help you to develop the habit of journaling daily. Research shows that it takes a person 21-30 days to develop a new habit so, therefore, this guide should help you on your way to making journaling a part of your routine. This is a write-in journal you can use to begin your journaling journey. It is perfect for all ages.